There is a better way! Rich-Context Features in Minutes. As a Small or Medium-Sized CXO so many things keep you up at night. With resources constrained, it is more critical than ever to be skilled in the art of maximizing your technology expenditures while being mindful of your business’s growth needs. Proxomo addresses one of your primary needs – low cost scaling technology for your enterprise apps quick to implement and in a low risk environment. Every company MUST have a comprehensive mobile and social media strategy to compete in today's marketplace. As you evaluate tools and services that deliver rich-context functionality for both internal use and consumer-facing web and mobile applications, Proxomo’s AppWare provides your one stop solution. We are a technology partner to SMBs providing our patent-pending AppWare enabling rapid develop of enterprise class applications and supporting your backend infrastructure needs in the cloud. Proxomo’s AppWare product powers your applications on both web and mobile platforms providing one consistent technology on the backend and provides the context tolls you need in your applications to engage your employees and customers. TRUST YOUR MOST IMPORTANT WEB AND MOBILE PROJECTS TO THE PROXOMO APPWARE. Whether you create your application in-house or have a third party build it, you have to maintain and scale the infrastructure to support it. 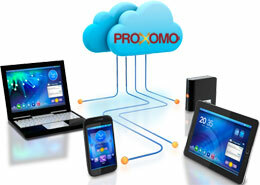 Proxomo is an extension of your internal mobile capability resources. Without Proxomo, your mobile strategy can become overwhelmingly complex. As you launch new applications, Proxomo provides a consistent control mechanism that unifies your service connections and core security across your applications. A basic application can take more time than you have when starting from zero - each component could take weeks or even months to develop. When your developers create applications, give them access to Proxomo AppWare with a pre-built suite of modules and services including a consolidated gateway to essential 3rd party APIs. This allows your organization to dramatically reduce development time and maintenance by up to 90%. Your mobile strategy must be able to adapt to market changes and the ever changing release cycles of 3rd party APIs and service vendors (such as Facebook). When changes occur, your team must be prepared to monitor and make changes 24/7 in today's globally connected world. When you build your applications using the Proxomo AppWare, we become an extension of your mobile maintenance strategy. We monitor and make updates so your team can focus on your internal systems and customers. Get started in the next five minutes simply prototyping or kick off a project. Our cloud infrastructure for your apps scale with your growing needs. We’re here to help you get where you want to go! We handle your server and database administration needs for your apps powered by Proxomo’s patent pending cloud AppWare technology.